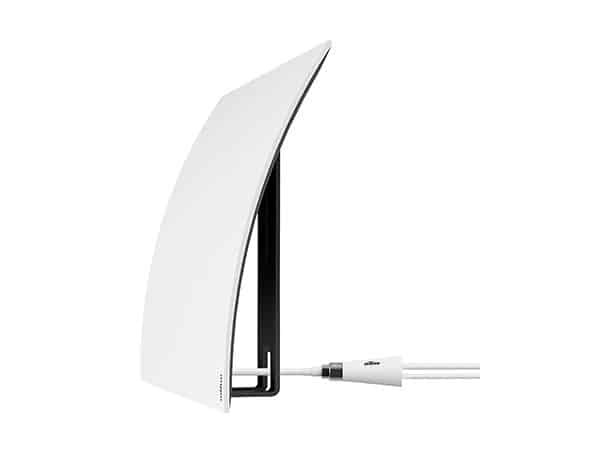 The Curve 50 propels antenna design to new heights with a clean and graceful arched structure reminiscent of popular smartphone docking stations. Curve 50 is the ultimate expression of the beauty and simplicity Mohu builds into every product. With its advanced technology inside, Curve’s elegance shines in its clean, graceful shape that captures broadcast television channels like a sail catches the wind. Your Curve 50 will make a beautiful design statement on a shelf, countertop, table or any other flat surface, while providing you with clear, crisp TV reception. Disclaimer: Channel reception will vary based on what is broadcast in your area, your distance from broadcast towers, and any geographical obstructions between you and the towers. Before you buy, use Mohu’s web tool to see what channels are available in your area. Channel reception depends primarily on geographical location and terrain. ESPN and FOX News (among other cable channels) are not available via free HDTV broadcast. • Full Hd Crystal-Clear TV: Multi-directional HDTV antenna now tested to reach 60 miles- receive crystal-clear picture in up to full 1080 HD (4K ready) in any direction no “pointing” needed. • Reception Totally Dependent On Location and the type of signal being transmitted in the area (VHF/UHF). DISCLAIMER: The results of available channels in your area is an estimate based on your location and the location of the TV transmitters in your area and is not guaranteed. Every location is unique in terms of local terrain foliage and installation details which will affect your reception.